While the American pitcher plants are pretty extraordinary, it is hard to imagine the excitement that affected botanists when the first nepenthes or monkey cups were brought to Europe. These scrambling or climbing plants from SE Asia and Northern Australia have the most amazing leaves. They are arranged spirally or alternately around the stems and begin with a regular-looking leaf blade that is lance-shaped but then extends into a petiole that twists to grab onto a support and also to allow the pitcher at the end to assume the correct position. And at the end of this twisted petiole is the pitcher that starts as a small swelling but this fills with air as it grows and finally opens, with two ridges of teeth, a rim to the opening of the pitcher and a lid that sits over the opening, protecting it from excessive rain. All this in one leaf – it is quite remarkable and makes even the adapted leaves of the venus fly trap seem rather ordinary – though of course the ability to move, quickly, of that plant is its claim to fame. Although there are two groups of nepenthes (highland and lowland) that require slightly different temperature regimes, all need a winter minimum of 10c and they require high humidity. 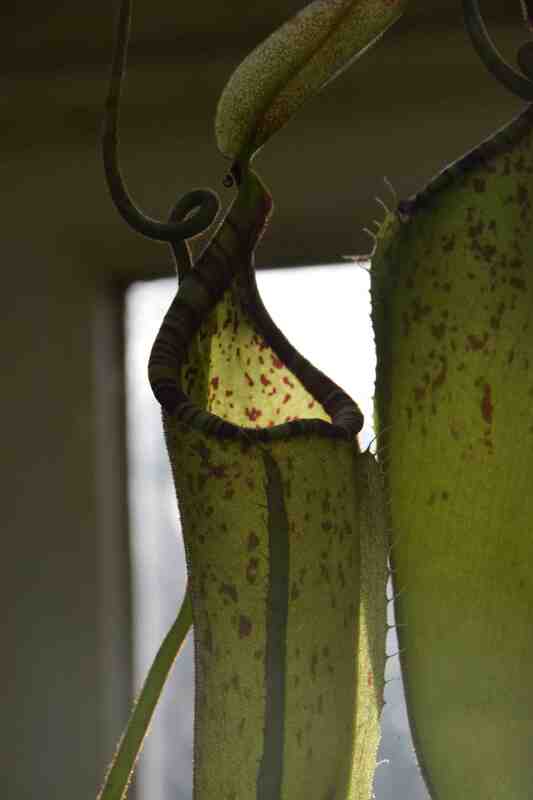 This means that only the most waxy-textured, that can tolerate lower humidity, make good houseplants but, of all the insectivorous plants, nepenthes are probably the best for heated homes and they are often sold as houseplants. They are usually sold in small plastic baskets and although most probably die soon after purchase they do stand a chance. Most insectivorous plants have pretty fancy flowers – sarracenias are large and ghoulish and butterworts (pinguicula) are just pretty – but nepenthes have dull flowers, in large spikes. Each plant produces either male or female flowers and most species interbreed so there are lots of hybrids. My most successful attempt with them was when I grew one in a greenhouse that was sunny and maintained at 10c in winter. It grew large and flowered and in the end I cut it into sections to root as cuttings because it was 2m high in the end. Most plants are raised by micropropagation commercially but they can be grown from seed. Unlike most insectivorous plants you can apply liquid fertiliser to these plants. In fact they benefit from some high nitrogen fertiliser applied as a foliar feed. Even so do not be tempted to make the compost too nutrient-rich or use loam in the compost. There is some debate over feeding and some feel that if you apply fertiliser the plants will stop making traps but I lightly fed my plant and used seaweed fertiliser and it did well. The traps, however, are produced by the plants to provide nutrients, and they are the main reason we want to grow them. In the wild they catch not just insects but small rodents and even birds. There is even a shrew that is attracted to the sweet substance produced at the mouth of the pitchers and defecates into the pitchers, using them as a lavatory. Small plants have small leaves and pitchers that sit on the compost surface but as they grow and climb they become less easy to accommodate, especially in the home and although they may seem to be perfect for a terrarium when small they quickly out grow their space. I saw these at a show here in P.R., but I haven’t seen them out in the open to photograph. They are indeed fascinating!